Join our launch party for local bestselling and award-winning prose and comics author, and teacher and leader of our Writers’ Coffeehouse workshops, Jonathan Maberry. In the latest in the Joe Ledger series, Joe and his team begin a desperate search for the secret to terrifying supernatural new drones technology and the madmen behind it. But before they can close in, the enemy virus infects Air Force One. The president is trapped aboard as the jet heads toward the heart of New York City. It has becomePredator One. Jonathan will also share a preview of May’s new middle grade series, Nightsiders: The Orphan Army, and how it fits into his universe. In The Orphan Army, Milo's Louisiana bayou is overrun with alien bug invaders and magical creatures. For information on this writing conference for high school students, please visit the official website. This year's Keynote speaker is Jonathan Maberry. More than 20 authors will be in attendance at this year's event! 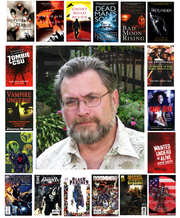 Best-selling and multiple-award winning and extremely busy author and editor and teacher Jonathan Maberry kicks off MG’s September events with his new zombie thriller, Fall of Night. Jonathan originally set his infected serial killer on the loose in Pennsylvania in Dead of Night; now a frantic search is on for the missing scientist who created the Patient Zero, as authorities consider drastic burned earth solutions to the spreading plague. Join Jonathan to discuss hand-to-hand combat, the Rot and Ruin books, his comics work for IDW Publishing, and what the future holds for the acclaimed local horror and thriller author’s works in print and on the screen. Launch Party for Jonathan Maberry in San Diego! Joe Ledger and the Department of Military Sciences return in Code Zero, sixth in Jonathan Maberry’s best-selling biothriller series, and the direct sequel to the book that started it all, Patient Zero. Join Jonathan to discuss the DMS, hand-to-hand combat, the Rot and Ruin books, his comics work for IDW Publishing, and what the future holds for the New York Times best-selling and multiple Bram Stoker Award-winning horror and thriller author’s works in print and on the screen. The NIGHT OF THE LIVING BOOK CLUB will discuss Patient Zero: A Joe Ledger Novel by Jonathan Maberry. Jonathan Maberry's book The Gods of HP Lovecraft was available from LibraryThing Early Reviewers. Jonathan Maberry's book Out of Tune was available from LibraryThing Early Reviewers. Jonathan Maberry's book Limbus, Inc. - Book II was available from LibraryThing Early Reviewers. Jonathan Maberry's book Joe Ledger: Special Ops was available from LibraryThing Early Reviewers. Jonathan Maberry's book Limbus, Inc. was available from LibraryThing Early Reviewers. Jonathan Maberry's book 21st Century Dead was available from LibraryThing Early Reviewers. Jonathan Maberry's book Dead of Night was available from LibraryThing Early Reviewers. Jonathan Maberry's book Monster's Corner was available from LibraryThing Early Reviewers. Jonathan Maberry's book Dragon Factory was available from LibraryThing Early Reviewers. Jonathan Maberry is currently considered a "single author." If one or more works are by a distinct, homonymous authors, go ahead and split the author. Jonathan Maberry is composed of 6 names. You can examine and separate out names.